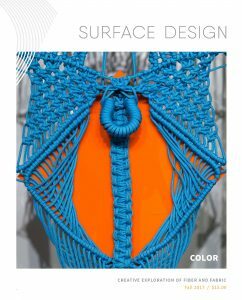 Surface Design Association is excited to announce “Color”, our Fall edition of Surface Design Journal! This Journal considers the theme of color from multiple angles and viewpoints–from aesthetic decisions and color theory to color’s weight as cultural significance. 1) “Category Is: Rainbow Linen Realness” by Danny Orendorff explores Jesse Harrod’s brightly colored macramé sculptures and installations that reference the wondrous diversity of bodies, parts, and pleasures. Jesse Harrod Rangers (installation view) 2015, Paracord, plexiglass, metal, knot tying, 67′′ x 16′′ each (installation dimensions variable). Photo: Stephen Probert. Courtesy of the artist and NURTUREart, Brooklyn, NY. 2) “Marie Watt and an Ecology of Cultural Imagination” by Fiona P. McDonald, PhD. 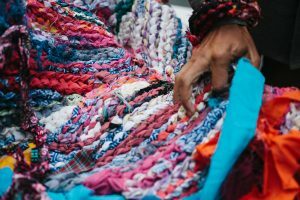 invites us to think about the way memories function in our material world, and our role in the stewardship of knowledge through the transformation of everyday objects like blankets. Marie Watt Placeholder 2017, reclaimed wool blanket, clear transparent glass Czech seed beads, thread, 561⁄2′′ x 1401⁄4′′. Photos: Aaron Johanson. 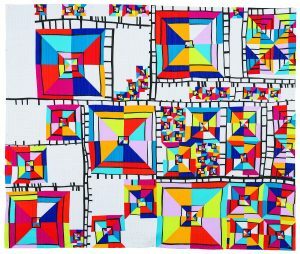 3) “Following the Creative Path of Color Theory” by Sharla Jean Hoskin examines the origins of scientific inquiry into color theory, and how those concepts are exemplified in the quilts on display at the group exhibition Quilt National 2017: The Best in Contemporary Quilts, organized by the Dairy Barn Arts Center. Margaret Black Line Study 17 2016, Kona cottons, thread, wool batting, cotton batting, free-form cutting, piecing, straight-line machine quilting, 90′′ x 75′′. 4) “Jeffrey Gibson: Post-Contact” by Jenelle Porter explores a recent body of work by Gibson that features heavily adorned punching bags whose colors and text praise racial, sexual, and gender acceptance. 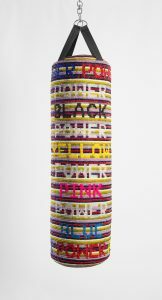 Jeffrey Gibson POWER POWER POWER 2017, repurposed vinyl punching bag, glass beads, arti cial sinew, acrylic felt, 51′′ x 12′′. Photos: Peter Mauney. Courtesy of the artist and Roberts & Tilton, Los Angeles, CA. 5) “Josh Faught: The Prose of Safe Spaces” by Leora Lutz spotlights the intuitive process in which Faught works–allowing narratives to naturally unfold through the use of collected ephemera, yarns, and “things”–to create weavings that reference pop culture, blankets, and personal experiences. 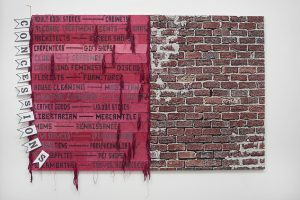 Josh Faught Between a Rock and a Hard Place 2017, hand- dyed, hand-woven hemp, Jacquard woven cotton, carnival air on linen, 70′′ x 108′′ x 2′′. Photo: John Wilson White. 6) “Black Fashion Designers” by Eulanda Sanders reviews the 2017 FIT (Fashion Institute of Technology) exhibition of the same name, which celebrates the contributions of over 60 Black designers, retailers, and models from around the world over the past 40 years. 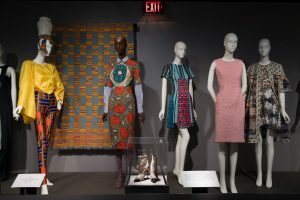 African Infuence section of the Black Fashion Designers exhibition presented by The Museum at FIT in New York City (December 6, 2016–May 16, 2017). LEFT to RIGHT: Patrick Kelly, trousers and hat, spring 1988, France. Gi of Bjorn G. Amelan and Bill T. Jones. Kente cloth, 1940s, Ghana. Museum purchase. Stella Jean, ensemble and shoes (in case), fall 2015, Italy. Gi of Stella Jean. Lisa Folawiyo, dress, spring 2015, Nigeria. Gi of Lisa Folawiyo. Mimi Plange, dress, spring 2013, USA. Gi of Mimi Plange. Christie Brown, dress, spring 2016, Ghana. Gi of Christie Brown. Photo: Eileen Costa. © The Museum at FIT. 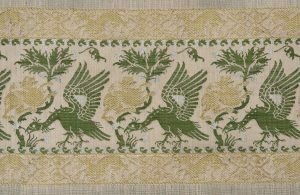 7) “Recreating 14th Century Silks” by Julie Holyoke recalls the collaborative reconstruction process of recreating eight silk textiles at Peers & Company atelier in Antananarivo, Madagascar for the European Hansemuseum in Lübeck, Germany. 6 Lucchese Lampas (completed detail), white and green silk we s, gold brocading. © Dario Bartolini 2015. 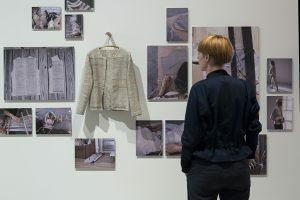 8) By Design, “Trending Now: Earth Matters” by Monika Auch surveys the innovative work commenting on sustainability as a trend, from the exhibition Earth Matters at the Dutch TextielMuseum in Tilburg, The Netherlands. Friends of light Second prototype for with light series 2015, (Earth Matters exhibition view) wool locally sourced in Hudson Valley, NY, handspinning, back strap weaving, garment construction. Each jacket represents 150 working hours of specialized skilled and collective know-how. 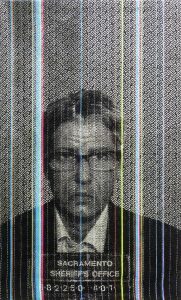 Photo: Jose na Eikenaar/TextielMuseum. 9) In the Studio, “Sustainable Studio Design & Environmental Responsibility” by Gretchen Morrissey spotlights the North Carolina studio that eliminates synthetic chemicals, encourages biodiversity, and focuses on a design process that promotes resilience within our ecological landscape. Gretchen Morrissey printing outdoors at her sustainable textile studio, 2017. Photo: Michael Morrissey. 10) First Person by Joanne Arnett looks at The Rogue Gallery series and the process Arnett goes through to create the weavings and imbue her own narrative into the colors. Joanne Arnett 18 Months with Time Off for Good Behavior 2013, bamboo and cotton yarn, tinned copper wire, 45′′ x 28′′. 11) Made Aware, “Ramekon O’Arwisters Crochet Jam: Making Space for Change” by Leora Lutz examines the devotion O’Arwisters has to engaging the public in meaningful ways through his Crochet Jam–a social practice participatory project where people are invited to crochet together. 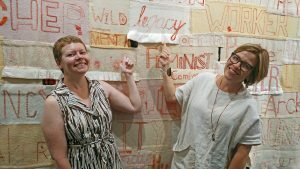 Ramekon O’Arwisters Crochet Jam (detail) held at the Sites Unseen public art installation launch and participatory project with Leah Rosenberg gallery and Fallen Fruit contemporary art collective (July 29, 2017). Photos: Mariah Ti any. Shown courtesy of Sites Unseen. In this edition we also say goodbye to our beloved Editor since 2012, Marci Rae McDade. Marci created such wonderful Journals that fueled the conceptual and member growth of SDA. We wish her the best of luck in her new endeavours into recharging her studio practice and whatever other exciting adventures await her! Marci with Marie Watt at her PDX Contemporary opening on September 7. Art: Companion Species: Ferocious Mother and Canis Familiaris (2017, reclaimed wool blankets, embroidery oss, hand stitching, 108′′ x 217′′). Photo: Jules Boyko . To buy a copy of “Making our Mark: SDA at 40”, go to the SDA Marketplace, or you can check out a free digital sample on our SDA Journal page.